According to a medium post released on March 25 by Hudson Jameson, one of Ethereum’s most highly active developers, the ‘Ethereum Cat Herders’ have confirmed that the proposed programmatic PoW (ProgPoW) audit has been approved. ProgPoW (EIP 1057) will become Ethereum’s new interim Proof-of-Work mechanism while the project transitions over to Casper - Ethereum’s future Proof-of-Stake consensus system. The main focus of ProgPoW will be to reduce the economic advantage of ASIC miners so that GPU miners can continue to operate on the network, and earn block rewards. This ensures that the network remains as decentralized as it can be. Least Authority have been selected as the third party auditers that will review the code, having already worked on Ethereum projects in the past. As per the official survey, over 43% of stakeholders and 100% of miners voted in favour of ProgPoW. 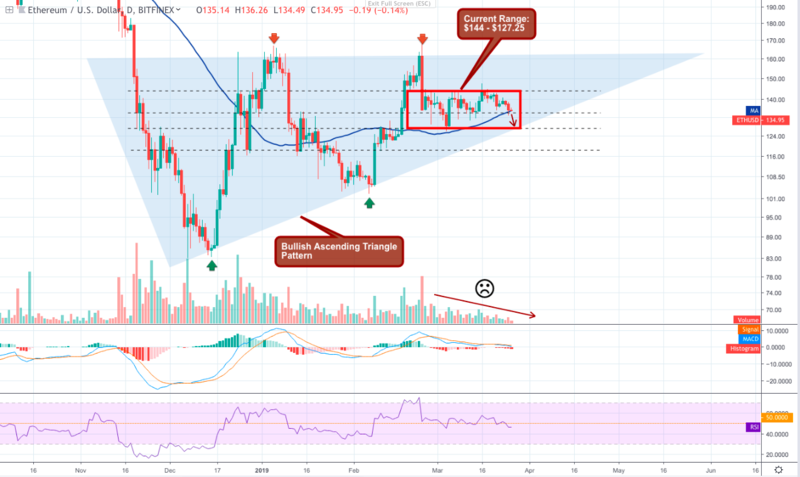 On the 1D ETH/USD chart, ETH continues to track inside a bullish ascending triangle pattern between a flat resistance at $160 and a strong uptrending support. Over the past 30 days, the price action has been stuck in a sideways range between $144 and $127.25 after a heavy sell-off that took place on February 24. Right now bear traders are testing a key interior level at $134 which has acted as both a strong support and resistance over the last month. This level is also supported by the 50 SMA which appears to be helping to slow down intraday selling momentum. Looking at a number of 1D indicators it seems that buying momentum and trading volume is beginning to thin as the asset sets up for a bearish phase. RSI has fallen below the 50% halfway line on the index channel. The 12MA has bearishly crossed below the 26MA, with selling candles appearing on the histogram. Candles are starting to close beneath the 1D supporting kumo cloud on the Ichimoku indicator. If sellers are able to break through the $134 level over the short-term then it is likely that the asset will seek stronger support further down around the $127.25 mark. This lower range support should provide a good foothold for buyers to recover from because the uptrending support of the ascending triangle pattern will be reinforcing it. If ETH rejects this however, then it is more than likely that the asset will continue bearish - Perhaps as far as the $105 support below. All ROIs are calculated from the asset’s current value at $134.30. 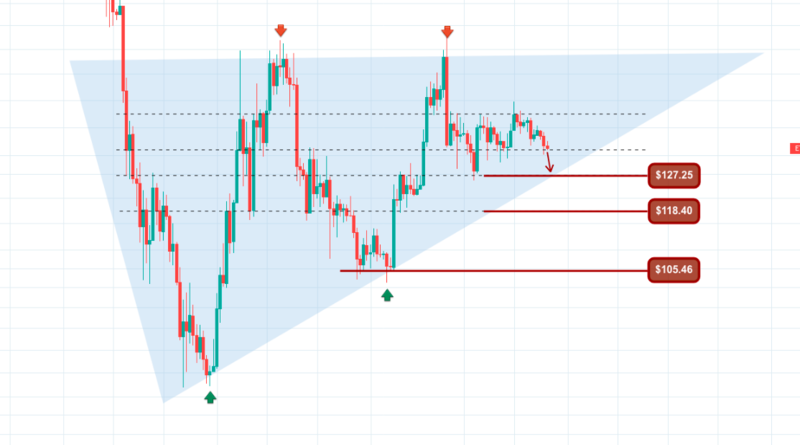 *If ETH breaks bearish out of the ascending triangle pattern, the price targets below are likely to become key supports.